Kitty Hawk, Oceanside. SPECIALS: 5/25 is $1075, 6/1 is $1295, 6/8 is $1575 and 6/15 is $1675 TOTAL including taxes! Pet fee only $100 for these weeks and rental gear and VRBO service fee not included. Discount will be added after reservation is made. (Q, D, 2S) Located on Lindbergh Ave approximately Milepost 2&3/4! NEW Owners means NEW upgrades! This ADORABLE Beach house is in a fantastic location! Walking distance of the beach, shopping, restaurants and ice cream for everyone! Small families will appreciate the quiet, family street location that's great for biking, jogging, walking and offers easy and direct beach access to the newly widened beach! Just 3 lots back from the ocean and approximately a 3 minute walk to the beach! Enjoy early morning coffee or evening cocktails on the covered furnished porch! Or better OCEAN VIEWS from the Crow's NEST! Perfect for your family and your Fur-Baby! -Free Bed linens & Bath towels year round, and beds made with a full week rental between 5/25/19 and 8/31/2019! Discounted, partial and special weeks not included. Because of hurricane Florence, we had to cancel plans at the last minute and look for something else. 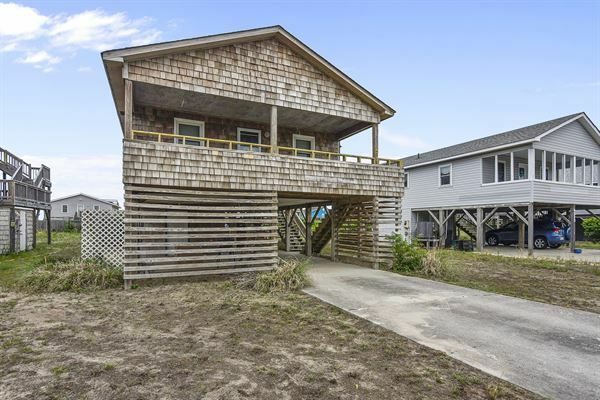 We found this house at Kitty Hawk and decided to take a chance. It was a perfect week and the prices were great! The house was very nice and clean-very spacious. A short walk to the beach which I did twice a day with my dog, and then a short drive for when we were carrying equipment for the beach. The rental company was fabulous! They replace the washing machine in one day, and also sent someone out to take care of a huge bees nest right after we called! Even though it&#x2019;s not oceanfront, you can still see the ocean from the back porch. Can&#x2019;t say enough nice things and we will certainly come back!